Romanticized in literature and myth for its ability to heal and reaffirm, the sea offers an instinctive setting for Mats Hjelm’s meditation on the histories of the transatlantic Middle Passage – the part of the Atlantic slave trade in which millions of people from Africa were shipped to the New World. The title of the exhibition, Taste of Salt, already evokes a synaesthesic quality. 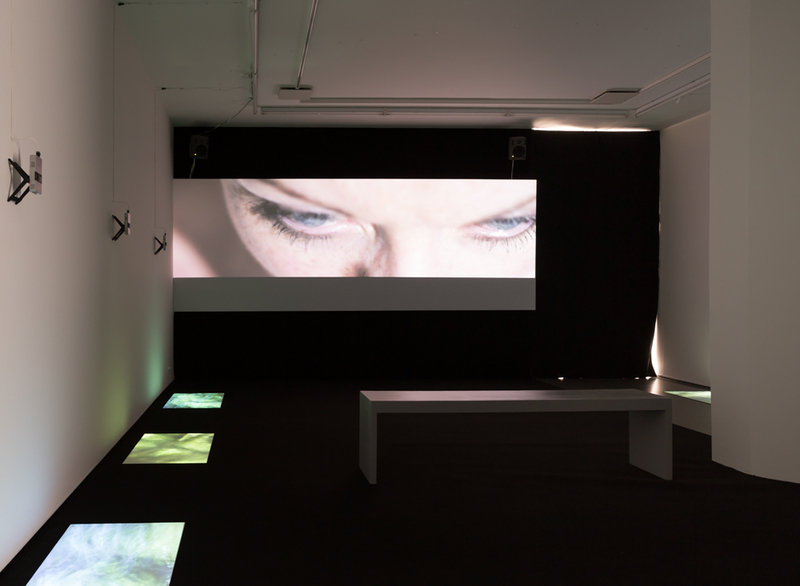 Conceptual and formal tensions unfold in three works: a video installation, a film, and a musical installation, where Hjelm features live sound for the first time. Together, they create mutually dependent environments where Hjelm thinks within and beyond the cinema screen. When I first met him in 2012, Hjelm had just returned from Africa where he is currently working on the sequel for his documentary film Black Nation (2008). Shifting his political focus from the Civil Rights movements in the US to neocolonialism by the US in Africa, he asks: does Africa need to be saved? By whom, from what and what for? From Detroit, Hjelm follows Kojo, a hustler-turned-millionaire who now finances missionary work in Liberia. There, he meets Preston Jackson, a former street kid from Monrovia, who highlights enduring tensions between colonizer and colonized. Preston tells of the revelation where, in migrating from the hills to the big city, he sees the ocean for the first time – naIvely mistaking the vastness of the sea for a football field of continental proportions. This becomes the poetic trigger for what Hjelm calls an “impure meditation on the ocean,” an environment where all that is solid melts into salt water. In the film Ithaka (alluding to the island in Homer’s Odyssey), an array of sound and image dissonances and textual paraphrases flow in double and single screen sequences. Made of entirely original footage in color and infrared from the past year, Hjelm’s journey leads us through sites of personal significance at home, the US and Africa, and finally triangulating across the Atlantic to Brazil. Detroit reappears as a mythical place of origin for the artist. Where is his “Ithaca” after all? …and hearing it, too. If during travel we meet diverse landscapes and colliding histories, we also hear different voices, some familiar, some strange. For Hjelm, sound becomes a visual medium with testimonials interspersed with gospel choirs, and excerpts from Samuel Beckett’s radio play Embers (1959), where a father-son motif alludes to Hjelm’s early works. A female voice reads stories drawn from multiple anonymous sources, and the music played is echoed by the live sound coming from behind the wall. In Those Out of Tune Also Have a Heart, yet another sonic dimension opens up in Hjelm’s sensory exploration voyage. We meet an unmanned electronic pipe organ that occasionally blurts out a strange melody – a MIDI version of khora music from Mali, translated into Western musical scales by collaborating musician Derek Gripper (SA) exclusively for this exhibition. Behind the instrument, images of unidentified landscapes forebode some scenes from Ithaka that loop us back into the other room. To come to something so simple, that we take for granted – to meet an experience such as seeing the ocean for the first time, may very well result in an odyssey towards our own “Ithaca,” where the ocean becomes an awakening of personal and historical consciousness as well as a possibility for salvation itself.